What happened on this day eight years ago may be stated simply: The Jihad delivered against America a most grievous and staggering blow. Conceived in blind bitter hatred, plotted in treachery and skulking malice, it was also — as befits the Jihad — a spiritually impotent blow. To erect a great symbol of resistance to the power of the infidels, these operatives made war on the defenseless and unwitting. Somehow the man who extolled the bravery of armed men attacking airline stewardesses is still a respected clever-man on TV. By now it is not uncommon for someone to pedantically chide the President for having called them cowards. But September 11 was not a blow delivered against the American fighting man. Against him the Jihad has generally withered or taken flight. The Jihad has not won a real battle against men of the West in many a year. We demean the word by calling what happened on September 11th a battle. It was a treacherous strike against men and women the great majority of whom never had even a moment to contemplate self-defense. That some Americans — who we venerate today where their mortal remains lie, in the wide fields of Shanksville, Pennsylvania — gave battle to these brigands, and in the end conquered them by thwarting their conspiracy, shows indeed their valor, but does not grant their murderers the honor of the title Soldier. The crown of honor on that day was won above all by the police and firemen of New York City, whose losses were terrible; these men who more than self their country loved. O beautiful, for heroes proved in liberating strife! 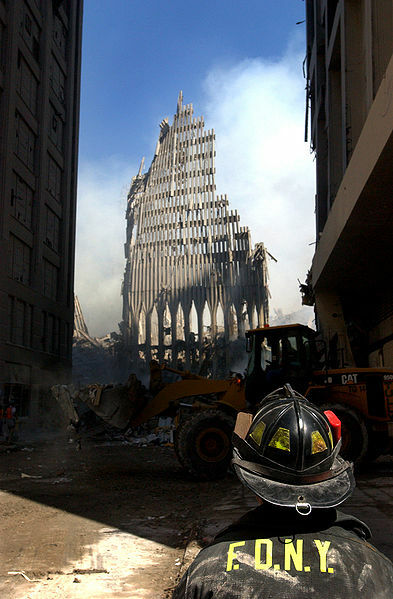 The Towers fell; the Pentagon burned; Lower Manhattan became a crematorium. It was the Jihad in brutal summary. The guilt of its victims, according to ancient doctrine, was fixed by their unbelief. America stood as the citadel and champion of Infidelity. There could be no innocents here. And so honor, innocence, charity, kindness, courage, nobility, valor — all must kneel at the feet of the obligation of the Jihad to make war on the powers of Infidelity. America is the greatest of those powers. Whatever our foreign policy, whatever the interventions of our military, whatever the skill of our diplomats, whatever the character of our statesmen — still we shall attract, at least for the time being, the boldest stratagems, the cleverest sedition, the cruelest bloodlust of the Jihad. Even now its agents and operatives are maneuvering against us. Even now they plot terror and mayhem and torture. Our countrymen perished in the flames of this wicked system, this terrible institution of Jihad. Today we remember them, we honor them, we lift up those who mourn them in prayer; and we steel ourselves for the day when the Jihad will try again. Thank you once again for bringing to our attention the significance of the day. On the other side of the world we too remember. We need to remember the millions of people that have since suffered because of our reaction to the 9/11 attacks. How many stories of innocent Afghans and Iraqis killed will we hear about over the next few days? When do we remember the lives of people who were caught between our lust to avenge our dead and the supporters of violent Jihad? As Christians, we at least need to remember the faceless and nameless thousands that have perished since we decided to live by the sword. "The Jihad has not won a real battle against men of the West in many a year." Actually, it has. It cannot be coincidence that the attacks happened on the 318th anniversary of the West's most crucial victory against Islam, but I've never seen any evidence that the killers made the connection between 9/11 and Vienna. Does anyone know of evidence to the contrary? Do not repeat in front me what you have just said, for I will not leave so long as the ungodly Muslims make war on me, who am the King of all the Muslims of Ethiopia, and I have confidence in the help of God. While I am attacked by wolves and dogs, by the sons of vipers and children of evil who do not believe in the Son of God, I will never return to my kingdom, and if I leave without going as far as Adal I am no longer the son of my mother; let me no more be called a man, but a woman. Steve, you're right. I just looked up the Brueghel. Is the problem "Jihad" or Islam? Their heroic leadership was decapitated early on and they lacked even a crude communications system, yet they somehow managed to spontaneously stage the greatest rescue operation in our nation's history. The hellish chaos of that day may prevent the story from being told in full and truly understood. A nation can lose her national honor, geopolitical advantage, squander her Treasury and suffer the needless loss of countless lives without ever once experiencing defeat on the battlefield. The most striking image I recall from the weeks after 9/11 was this cover of the New Yorker. It offers an uncanny perspective to the nihilistic spectacle that traumatized the country. By the standards of a true Christian soldier, we are not merely headed in that direction, we have already arrived there. The question is do we have the moral wherewithal to change our course. And I hope, "Occupy til I come" isn't being misinterpreted as a Scriptural endorsement of liberal interventionism, "nation-building" and armed cultural transformation.